I bought my first copy of Stellaluna before my daughter was born and it became one of our all-time favorite books to read together. (Verdi was probably a tie.) When I got a shower invitation from my niece lately asking people to bring a book instead of a card along with their gift, I grabbed three of our old childhood standbys: Stellaluna, Verdi, and The Runaway Bunny. It’s so hard to choose so few out of so many of our favorite books, but she may be inundated with more books as her son gets older. 😉 I also ordered a new favorite, A Boy and a House, but I’m not sure it will get here in time for her shower. Stellaluna is a baby fruit bat whose mother drops her accidentally during an owl attack. Stellaluna manages to fly away uninjured and finds herself adopted by a family of birds. Being a flying creature that hangs upside down to sleep and doesn’t like bugs is hard when you’re in a family of birds who prefer to fly during the day, sleep upright in their nest, and who turn down their noses at fruit. But they still all love one another, and the baby birds actually try to act a bit more bat-like with some rather painful results. 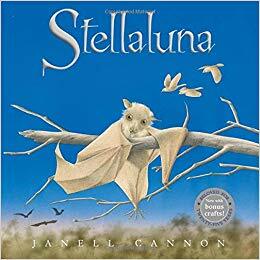 One of the most adorable scenes is Stellaluna trying to learn to alight on a branch like a bird lands, rather than a bat. But every picture is adorable right down to everyone’s facial expressions. The vibrant pictures by Janell Cannon are whimsical, beautifully colored, and simply mesmerizing, making the text almost superfluous. (But not quite.) Stellaluna is a story of what it means to be family, what it means to feel different and like an outsider, and what it means to accept and love people even when they act in a manner that seems strange to you. You don’t have to understand someone to know that they are a person worthy of your love. Lots of good conversations will start with reading this book, not to mention initiate countless hours poring over the intricate and delicately colored illustrations. This 25th anniversary edition of Stellaluna includes colored versions of the small previously black and whtie line-art drawings on the text pages and a code to download craft and activity kits. There are also two pages about bats at the back of the book, which were updated for this edition. Highly recommended for anyone who loves to share beautiful picture books, heartwarming stories, and inspiration to understand that being different isn’t a bad thing. Simply one of the best picture books for children.